From the overpowering scent of markers to the unnatural chemical coloring of paints, mainstream kids art supplies don’t typically create a pretty picture for our health or that of the planet. The good news is, there are fabulous artistic alternatives including paints made from vegetable-based dyes and petrochemical-free soy crayons. 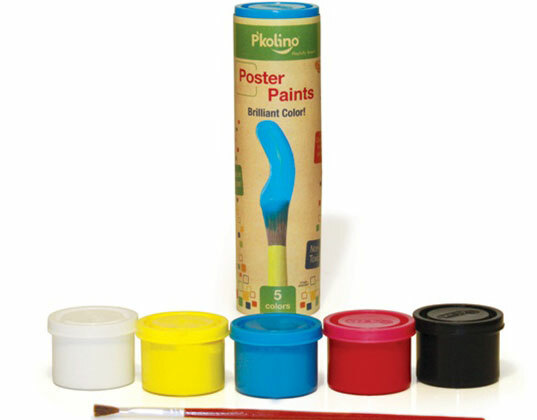 If you’ve got a budding artist on your hands, here’s a list of our top five must-have eco-friendly art supplies. Clementine Art covers all the bases with their all-natural supplies, and made history by being the first art product company to disclose every single ingredient on their packaging — you won’t find any synthetic preservatives, petroleum bases or animal byproducts in their supplies. The products are innovative beyond their eco-friendliness, too. Crayons come in two fun to hold shapes, modeling dough is fruit-scented, the washable glue is versatile enough to use on fabric, paper and wood, and both quick-drying markers and paints are colored with Mayan mineral earth pigments. 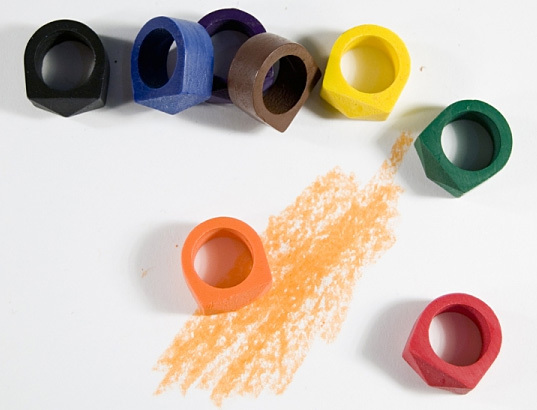 Designer Timothy Liles delivers a new twist on a toddler staple with Crayon Rings. A brilliant idea — these crayons, made locally in New Hampshire, are shaped to fit around fingers. Kids will love slipping one or five on to scribble, and they’ll literally always have their crayons on-hand for impromptu art projects. 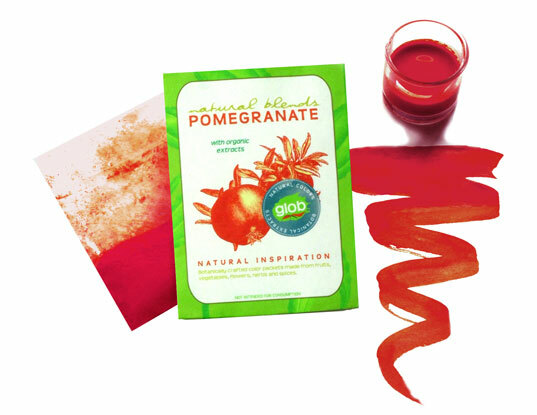 Glob proves that punchy paint colors don’t have to come from a combination of chemicals, their Natural Color Blends get their hues from pigments found naturally in vegetables, fruits, flowers, roots, herbs and spices — basil makes green, pomegranate makes reddish orange and so on. Simply mix the packet with water for a fabulous vegan paint, which is free of petrochemicals, VOCs and other toxins. Favorite furniture and toy designer P’Kolino teamed up with Spanish company Jovi to bring a high-quality, non-toxic line of art supplies to the US. The collections includes easy-to-hold Triangle Crayons, wood-free Hexagon Colored Pencils, water-based poster paints and finger paints, and low odor markers made from food dye inks. Creating art and craft projects is never a mess-free adventure for kids. Keep them clean with a one-size-fits all pullover Art Smock from 3 Sprouts. 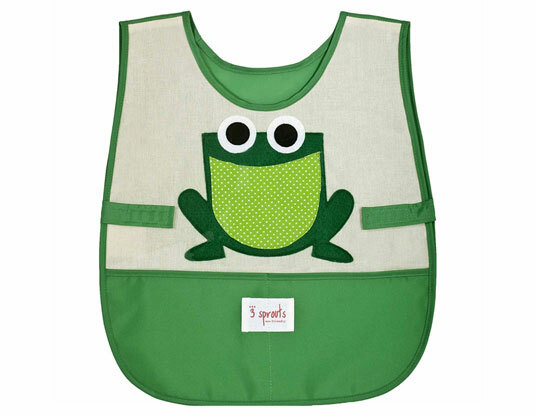 Available in frog, monkey or cow styles, the eco-friendly smocks are made from recycled nylon and eco-spun felt made from water bottles. There are even two big front pockets for storing supplies. From the overpowering scent of markers to the unnatural chemical coloring of paints, mainstream kids art supplies don't typically create a pretty picture for our health or that of the planet. The good news is, there are fabulous artistic alternatives including paints made from vegetable-based dyes and petrochemical-free soy crayons. 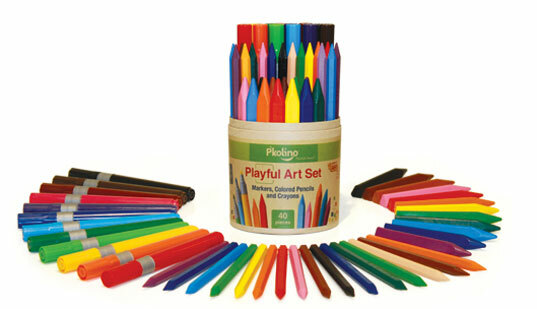 If you've got a budding artist on your hands, here's a list of our top five must-have eco-friendly art supplies.